MCRC is a cooperative research center dedicated to helping Australian companies increase their global relevance through research-led innovation in manufacturing. Its latest project involves a partnership with Downer’s Mineral Technologies business as well as the University of Technology Sydney Rapido advanced technology development unit. The three organizations will work together to research solutions that will advance ways in which composite polymers are used to manufacture mineral separation equipment and create new manufacturing technologies. 3D printing will be involved in the project, which is anticipated to run over a three-year period. The work will take place at a new additive manufacturing facility at the University of Technology’s Broadway campus, and will involve Rapido, a rapid prototyping unit established by the university in 2016 to help industry, government and community partners transform ideas and problems into solutions and products. Last week, I was in Spain with HP and much of the conversation was on how 3D printers were going to disrupt and revolutionize manufacturing. However, underneath all of the discussions was a growing concept that the factory itself, as these 3D printers advance and become more capable, would evolve into a huge and vastly more capable 3D printer. Except, rather than printing parts, these huge printers would print things like fully capable automobiles. Granted, we are likely a couple of decades out but talk about disruptive technology revolutions this could be a massive game changer because it anticipates a time when, rather than regional warehouses, Amazon might have regional mega printers. Until recently, 3D printers were more of a science experiment than an actual tool. The parts, while physically representative, weren’t very robust or, if they were robust, they cost more than most other manufacturing methods. HP’s Jet Fusion printers changed that by producing parts that were about 1/10th the cost of aluminum, had similar strength, but came in around 1/10th the weight as well. Suddenly, we had 3D printers that could produce parts that were arguably better than traditionally produced parts and, rather than being more expensive, they were significantly less expensive. 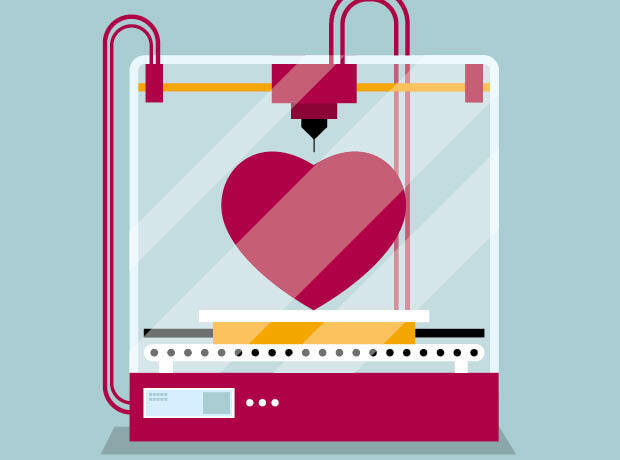 3D printing is transforming certain industries – so why hasn’t it been widely adopted in the pharma sector? There are likely to be a number of barriers to entry for 3D printing in this field, including identifying how to make it economically viable. Whilst a number of the key patents relating to 3D printing have expired and certain 3D printers have become cheaper, the printers and inks required for the 3D printing of pills are not yet readily or cheaply available. In addition, 3D printed pills are still being researched. Even when these challenges are overcome there is the further potential difficulty of changing the supply chain; switching from centralised to local manufacture and the supply of “inks” to enable the 3D printing of a pill instead of the pill itself. However, as can be seen from some of the opportunities that this technology provides, there doesn’t have to be an all-or-nothing adoption of 3D printing; it can be used to complement a company’s existing manufacturing techniques. 3D printing is giving a Spanish university team the edge in the annual Formula Student competition. The ETSEIB team is comprised of engineering students nearing the end of their studies at the Polytechnic University of Catalonia (UPC) Spain. Working with 3D printers from local manufacturer, BCN3D Technologies has streamlined the manufacturing process. Since 1998, the Formula Student competition, has pitted international university students against each other to produce, construct, test and then race small-scale formula style racing cars. The event is organized by The Institution of Mechanical Engineers, (IMechE) to promote innovative engineering. The team has over four years of experience in manufacturing combustion and electric cars. In this Q&A, Gartner analyst Pete Basiliere discusses how advancements in 3D printing may move beyond prototyping to help improve traditional manufacturing processes. Although 3D printing technology is not new, aside from a few use cases and industries, it has yet to make significant inroads as a manufacturing alternative. However, developments in 3D printing technology — also known as additive manufacturing — continue to advance, with new printing machines, processes and materials becoming available. Equally important are the software systems that help companies manage and run 3D printing and newly emerging 3D printing networks that can enable it on demand for organizations that don’t want to implement such activities in-house. In this interview at the recent Rapid + TCT trade show of 3D printing technology, Pete Basiliere, Gartner research vice president for additive manufacturing, spoke about the industry and how 3D printing may become an integral part of manufacturing processes. For the oil and gas industry, digitalisation is much more than automation, artificial intelligence and cybersecurity. It’s the opportunity to reimagine the design, manufacturing and operation of the assets and technology, leading to expansive breakthroughs in safety, efficiency and performance. Nowhere is this promise more evident than in additive manufacturing (AM). More commonly known as 3D printing, AM will provide oil and gas companies with the power to transform how parts are created and optimised. The ability to fabricate parts on-demand stands to upend established and often inefficient supply chain models, reducing costs and opening the door for innovation. Radical change is coming. The successes of early adopters, coupled with the wealth of expertise and resources now available, gives little reason for companies to press pause on starting their AM journeys. The barriers to entry have never been lower – and the rewards so high. The history of the Oberle shoe company began more than 150 years ago. In 1859, the great-great grandfather of Oberle’s current General Manager, Achim Oberle, opened a cobbler’s shop in Ettenheim that made shoes for customers in town and the surrounding areas. In 2006, the company began specializing in “Healthy Shoes.” And today, it’s recognized as a leader in the orthopedic footwear technology space. The company saves a lot of time and money by using the German RepRap X350pro 3D printer. Oberle – Gesunde Schuhe is a specialty manufacturer that develops products for everything associated with legs, feet, and/or extremities. Behind its products is a highly technical process. The so-called 3D posture analysis (which involves 3D measurements of whole body posture), as well as the 3D walking analysis (which measures gait, body angles, and forces), have long been standard procedures for this company. To stay on the cutting edge of the industry, Oberle – Gesunde Schuhe must continuously employ state-of-the-art technologies as they become available. At this year’s Rapid TCT show, additive manufacturing systems were on display, and booth-by-booth, we heard the rationale for serial 3D printing production, i.e., manufacturing. Trade shows often come with an unstated theme. The second LiveWorx conference in 2015 came with the theme: “IoT can be deployed from product development through manufacturing and customer use.” A couple years ago, Siemen’s PLM World users’ conference was all about digital twins. At Advanced Design and Manufacturing in Cleveland last year, presenters and attendees were talking about how small- to mid-size companies were ready for smart manufacturing technology. When I found out one of IndustryWeek’s scheduled plant tours in Raleigh for our recent conference was going to be at an on-demand 3D printing manufacturer, Protolabs, I knew what I had to do: Demand I be the tour guide. I thought of all the reasons I needed to go, from seeing all the high-tech machines to seeing cool processes such as stereolithography (SLA) up close to a recent chat with Protolabs CEO Vicki Holt. Unfortunately, I didn’t get to storm into my boss’s office like a cop show detective would to present my evidence, as evidently, I’m the technology writer and was the going to go anyway. Once I got to the rural one-floor facility, I received another pleasant surprise. The most impressive part about the place was not the millions of dollars of 3D-printing hardware, but the people who operated them. The Minnesota-based Protolabs, which also has plastic injection molding, CNC machining and the recently acquired sheet metal services, is brand agnostic, so the company’s strength is 100% the people working there.